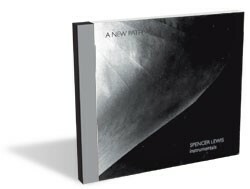 Throughout much of his earlier canon, Vermont composer Spencer Lewis has tended to present his instrumental recordings thematically, whether on the pastoral splendor of 2007’s Green Mountain Suite or, more recently, the dramatic post-Irene opus Vermont Resurrection. It is curious, then, that Lewis would title his latest instrumental work so comparatively vaguely: A New Path. Curious, because at no point in the album’s 50-plus minutes does Lewis lay out any distinct new direction. Instead, he has presented a nebulous work that is very much open to interpretation, an album that can be experienced casually and simply as serene background music. Yet it can also reward more engaged listeners, those who will pay close attention to its rich nuances and absorbing atmosphere. Lewis is a terrifically gifted guitarist and violinist. And throughout the album he provides ample room for those talents to roam. From the bright, lively, melodic turns of “Into the White” to the broad, ethereal expanse of songs such as “11th Moon” and album closer “Some Morning Soon” Lewis crafts inviting, rustic soundscapes. Think of the album as Americana for the new-age set. Lewis is aided by pianist Ariana Lewis, mandolinist Kristina Stykos and drummer Jeff Berlin. Each of those instrumentalists shines in moments, adding varying degrees of texture and balance. But Lewis rightly remains the focus. Whether picking playful melody lines on guitar or pirouetting through the stratosphere on violin, he is masterful. What is most alluring about the record is the calming, bucolic nature of Lewis’ compositions, not necessarily his individual instrumental performances. From start to finish, his works blend together seamlessly, almost hypnotically. It’s hard not to lose yourself in the warm wash of the violin, the quiet ripples of piano or the gentle thrum of guitar. In lesser hands, these soothing suites could venture too close to earnest, impressionistic schmaltz. But Lewis carefully navigates that treacherous terrain with guile and grace. A New Path is a record characterized by its soaring beauty, which is grounded by Lewis’ own sense of restraint and taste. These qualities open each of his compositions to personal contemplation and invite listeners to derive their own meanings, to find their own paths, from his stirring tones. A New Path by Spencer Lewis is available at spencerlewismusic.com.